In a small sauce pan, add chopped figs, currants, water, rum, and brandy and bring to a simmer. Once simmering, carefully light the mixture and remove pan from heat. Burn off alcohol for about a minute. Be very careful while doing this. Figgy pudding is a traditional holiday dish. Here's your personal guide to show you how it's made. We’ve all sung it: "Bring us a figgy pudding and a cup of good cheer!" But what is it? That’s an excellent question, and one that I hunted down the answer to. 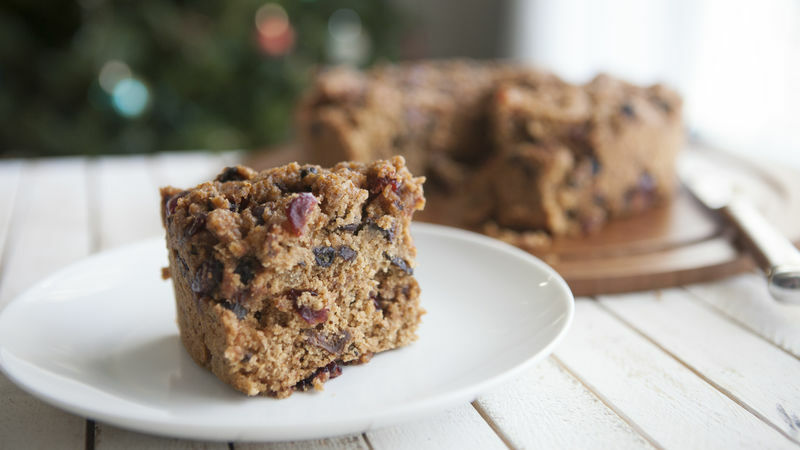 It turns out that figgy pudding is sort of a cross between a fruit cake and your liquor cabinet! In other words, it’s very good. I roughly adapted this boozy figgy pudding recipe from an excellent NPR recipe that was posted many years ago. It led me to the figgy pudding light. As the name implies, this pudding (more of a cake) starts with figs. Dried ones, to be exact. Roughly chop these guys and add them to a small pot with some raisins (I used currants). Add the water, rum, and brandy to the pot and bring it all to a slight simmer. Now for the fun part. When the mixture is steaming, remove it from the heat and carefully bring a flame to the side of the pot. The contents should light on fire, which will burn off most of the alcohol. Let this burn for about 60 seconds or so. It’s totally safe, but obviously don’t leave the pan while it’s burning off! Blow out the flame after it has cooked off a bit and then let the mixture cool. Then whisk together all your dry stuff in a small bowl. Add your butter, eggs, sugar, and bread crumbs to a separate, larger bowl. And chop up all the dried fruit. You could use any dried fruit for this, but I like cranberries and apricots. Whisk together the egg mixture and then add the dry stuff and the fig and booze mixture. Stir this all together well and then fold in your dried fruit. It should be a really thick mixture. To cook this pudding, we are going to steam it (rather than bake it) to keep it really moist and delicious. To do this, get a large angel food pan and butter it liberally. Then get a larger pot that the pan can fit inside. Once the pan is buttered, scoop in all your pudding batter and smooth it out in the pan so it’s even. Cover the pan with foil and place it in the larger pot. Fill the pot with water so the water comes at least halfway up the side of the angel food pan. Bring it to a simmer, cover, and let it simmer over low heat for two hours. Check the water levels in the pot every 30 minutes and add more water if you need to. Once the dish is steamed, let it cool, remove it from the water bath and turn it out onto a serving dish. Then you can just slice it up and serve it! I think it’s best while warm, but you can store it for later also. Now you can really bring the figgy pudding! Nick will bring you figgy pudding and so on and so forth! Check out his blog, Macheesmo, and follow him on his Tablespoon Profile.